If you want a spacious passenger van that looks and feels like more than just another van then this is the one you want to get! The VW Transporter has plenty of space to set up to nine people and has all the cargo space you would need for them in the boot. It's well built and drives surprisingly well for a larger boxy passenger van. 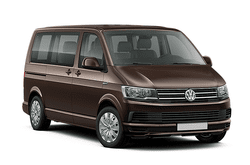 Whether it is for vacation, business meetings, or other transportation needs, treat your passengers right with the comfort, style, and luxury of the Volkswagen Transporter! Make your reservation today and enjoy great mileage, advanced safety features, and comfort that makes any drive a pleasant one for everyone involved.